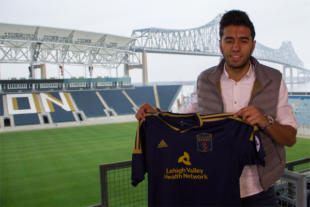 Bethlehem Steel announced on Tuesday the signing of Philadelphia Union Academy product and US youth international Matthew Real. Real, a defender who began with the Union Juniors at the age of nine, made two appearances for the Steel in the inaugural 2016 season. The defender also has experience with the US U-15, U-16, and U-18 BNTs, including the US U-18s’ trips in 2016 to Argentina and the Czech Republic. Real is the third player from the Philadelphia Union Academy to sign a professional contract with Bethlehem, following Derrick Jones, the team’s first-ever signing, and Yosef Samuel. Jones is now signed to the Union along with fellow Academy product Auston Trusty, who made 13 appearances for Bethlehem as an amateur player. With the signing, Bethlehem’s roster now stands at 10 players: Real, Bolu Akinyode, Amoy Brown, Cory Burke, James Chambers, Seku Conneh, Josh Heard, Matthew Perrella, Hugh Roberts, and Yosef Samuel. Yosef Samuel is also from the Academy. Very nice kid. Honestly this is the kind of news that excites me the most right behind any upcoming news of a legit DP 8. Developing players throughout their early teens, then them ending up in one of our two pro teams – either straight as a HG or something like this – is what is going to create long term quality in the organization. Also of note, the Union drafted 3 more players. I’m guessing they will most likely be signed to the Steel. Round 3 Pick 11 (55 overall) – Chris Nanco – 21 year old, 5’6″ forward from Syracuse. 21 goals and 7 assists in 84 games (80 starts). Born in Canada. Round 4 Pick 11 (77 overall) – Jack Elliott – Senior midfielder/defender from WVU, stands a towering 6’5″ and was born in England. Round 4 Pick 16 (82 overall) – Santi Moar – 23 year old, 5’8″ forward from Pfeiffer. 24 goals and 33 assists in 45 games (44 starts). Born in Spain. 1) All three players were born overseas. Not sure about official nationalities. 2) Both forwards are rather small meaning they could be projected as wingers in a 4-2-3-1 or 4-3-3 system. Since the organization is pushing “the same way of playing throughout all levels” it could be a good indication of what system the team is thinking longer term (4-3-3?). Much obliged C. Pfeiff, much obliged. Derrick Jones was signed to the USL roster last off season in December of 2015 (by memory, and Yosef Samuel was signed to the USL Roster last September (by memory. so Matt Real is the 3rd signing directly to the Steel USL roster. Auston Trusty was signed to a zero Dollar contract, so-called by Coach Burke last season, in order to play with the Steel, but that was not a professional contract. Trusty’s first professional contract was with the Union itself. This season for the Steel should be quite interesting to watch. More players being developed for the first team should have me watching a lot of YouTube. Whats going on with his hair? Is that some sort of pompadour? Ha ha. Give the kid a break. How many of us would be proud of our haircuts when we were 17? Can he later be signed to a homegrown MLS contract? Most likely yes, as the Derrick Jones signing demonstrated recently. Thanks. Forgot about the Jones signing, was thinking of Trusty who was never on a Pro Deal. So signing them to USL for development and then to a homegrown deal is best for the club. Assuming the player does not want too much when they sign the Homegrown deal. I heard he was offered a full ride to Wake Forrest and a European club was interested in him as well. Turned it all down to go for it right here in his home town! It’s exciting that we’re finally creating a structure in American soccer that bright youngsters with potential can be identified and get high quality training and minutes against professional players. This is only good news, well done. I hope they figure it out this year with the roster though for the steel, it seems like last year was a joke.